I have no idea what to make of this dizzying book. Wink, Poppy, and Midnight take turns telling their versions of what happen in this mind-bendy tale. There are hints of fairy tales and ghost stories, as the three characters offer their views of themselves and each other, but only ever tell part of the story. Mystical elements abound, from tarot readings and hauntings to certain evocative tastes and smells. The names in the story are odd and whimsical — not just the three main characters, but their various friends and family members, including Leaf, Buttercup, Alabama, and Peach. What seems a straightforward story of an ultra-mean mean girl, the people under her thumb, and the wild girl who offers a different path… isn’t. Wink, Poppy, and Midnight interact and become parts of each other’s stories. Midnight is our most relatable point of view in the story, the sweet and honest boy next door, but his perspective isn’t as reliable as he’d like to think, and he doesn’t really see beyond what’s in front of him. It’s hard to describe this book without giving too much away. It’s frustrating that the book has been so built-up as a twisty, turny, surprising shocker. Even the cover blurb (“A hero. A villain. A liar. Who’s who?”) puts us on alert that we can’t believe what we’re told or take the characters at their word. I wish we didn’t have this heads-up. It would be much more powerful and shocking if we weren’t told ahead of time not to trust what we see. I read Wink Poppy Midnight in a single day. It’s a book that just begs to be gulped up. I’m not sure that I’ve fully figured out why certain things happened as they did or what the motivation was — and I don’t know if that’s because I haven’t gotten there yet in my processing of the story, or if the resolution just wasn’t as clearly explained as it should have been. In any case, it was a fun, trippy, absorbing read that sucked me in completely and didn’t let me go until I got to the last page… even if I’m not convinced that it makes the slightest bit of sense. But, hey, that’s one hell of a great cover! 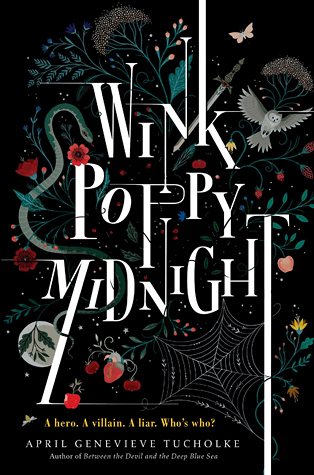 If anyone else has read Wink Poppy Midnight, I’d love to hear what you thought. I have heard mixed reviews on that one, so I wasn’t sure whether to read it or not. It does sound interesting, even though it’s not exactly what the blurb suggests. Great review. I’m really intrigued by this one. I’m hoping to read it soon! I hadn’t heard about this one – good to see an honest review that still makes me want to take a look! If you check it out, I’d love to hear what you think! This sounds really exciting, I’ll add it to my tbr list! I am really interested in reading this book. I’ve heard good things from a lot of bloggers, but then on Goodreads a completely different thing. Guess I will have to find out for myself.